What’s your favorite way to use lemon juice? Photo courtesy Wikimedia. August 29th was National Lemon Juice Day. We had a basket full of lemons on the kitchen counter, so we turned on the electric juicer and set out to see how many different things—edible things—we could do with lemon juice. There are many uses for lemon juice in the home. A partial list includes: household cleaner, copper cleaner, stain remover, room deodorizer, laundry brightener, hair shiner, nail treatment, sore throat gargle and digestive aid. Room Temperature. Juice the lemons at room temperature. If you don’t have time to let them warm naturally, microwave them one at a time for 20 seconds on high. Roll ‘Em. Roll the whole lemon under your palm on the countertop, pressing down. Electric Juicer. For $25.00 or so, you can get an electric juicer that extracts every last drop with almost no effort. 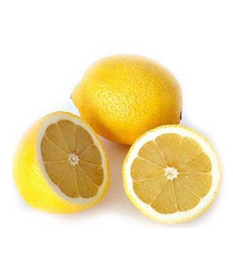 Yield: 1 medium lemon yields 2-3 tablespoons of juice; 5-6 lemons will yield 1 cup of juice. Zest: Don’t forget to save the zest. Here’s what to do with lemon zest or other citrus zest. Anti-Browning Agent. Keep cut fruit and vegetables such as apples, avocados/guacamole, fruit salad, pears and potatoes from turning brown by sprinkling, tossing or brushing with a little bit of lemon juice (you can mix it into the guacamole). Clean The Grater. Cheese is always stuck in our grater. Grab a lemon half and rub both sides of the grater with the pulp side. You can slice off the top of the lemon and use it for food. Lemon Water. Perk up your daily glasses of water for flavor, the antioxidant vitamin C and other health benefits. Marmalade. If you make jams and jellies, try lemon marmalade. We like it as a garnish with grilled fish/seafood and roast poultry. Marinade. Add lemon juice to marinades for fish or meat. It’s a flavorizer as well as a tenderizer. Pancakes. Lemon juice, along with baking powder, makes lighter and fluffier pancakes. Here’s a recipe. Soft Drinks. We grew up in an era of Lemon Cokes. Add lemon juice to cola and fruit sodas. See how it perks up cherry, lemon-lime, orange and raspberry pop. Veggie Saver. Perk up wilted lettuce and other greens by soaking them for an hour in a bowl of cold water and the juice of one lemon. How do you use lemon juice? Let us know!